The past-producing Troilus gold mine near Chibougamau, Quebec. Source: Troilus Gold Corp.
Troilus Gold Corp. [TLG-TSXV] on Wednesday February 6 reported a significant increase in share ownership of the company by management and the board. Within the last three months, members of the Troilus management team and board of directors have acquired over 2.72 million shares, an amount that represents approximately 5.2% of the shares outstanding, the company said in a press release. Within this period, Troilus CEO Justin Reid personally acquired 1.9 million shares. “The recent increase in share ownership of Troilus by management and insiders is evidence that we are completely aligned with our shareholders,” said Reid. He went on to add that 2018 was a milestone year for the company. Troilus Gold shares eased 1.3% or $0.01 to 74 cents on Wednesday. The 52-week range is 86 cents and 40 cents. Troilus is a Quebec-focused, exploration and development company. It is aiming to restart the former Troilus gold-copper mine, which is located on 16,000 hectares of ground near Chibougamau, Quebec. From 1997 to 2010, Inmet Mining Co. operated the Troilus Project as an open pit mine, producing more than 2.0 million ounces of gold and 70,000 tonnes of copper. Inmet was acquired by First Quantum Minerals Ltd. [FM-TSX, FQVLF-OTC, FQM-LON] in March 2013. After the mine ceased production in 2009, the 20,000 tonnes-per-day mill processed low grade stockpiles until June 29, 2010. The mill was sold and shipped to Mexico and the main camp facilities were dismantled. Right now, a small number of personnel are based at the site to oversee the on-going site restoration, environmental monitoring, and exploration work. A new 50-person camp, core logging facility and office were built last year. 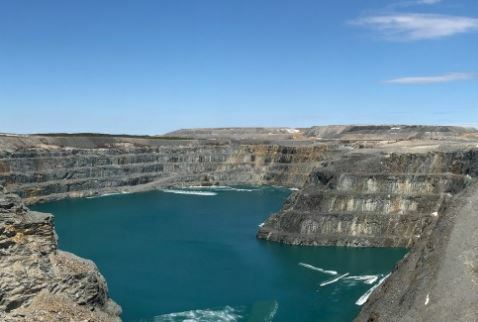 According to a January 2019 technical report prepared by Roscoe Postle Associates Inc., combined open pit and underground resources at the site are estimated to be 121.7 million tonnes grading 0.87 g/t gold, 0.086% copper or 1.00 g/t gold equivalent, including 3.4 million ounces of gold, 231.8 million pounds of copper and 3.92 million pounds of gold equivalent in the indicated category. On top of that is an inferred resource of 36.1 million tonnes, grading 0.88 g/t gold, 0.083% copper, or 1.01 g/t gold equivalent, including 1.02 million ounces of gold, 66.2 million pounds of copper and 1.17 million ounces of gold equivalent. In 2018, Troilus investigated the potential to extend the known gold mineralization in zones J4 and J5 to the north and at depth. As gold mineralization is still present in the northernmost 2018 boreholes, the potential for a continuation of both zones to the north is open, the company has said. In November, 2018, Troilus tripled its land position in the region by acquiring the Troilus North Project from Emgold Mining Corp. [EMR-TSXV]. “The acquisition of Troilus North adds a significant strategic land position and focuses our 2019 exploration drilling on extending the J Zone to the Northeast,” said Michael Timmins, Senior Vice-President, Corporate Development at Troilus Gold. The Troilus North Project covers 11,300 hectares and lies to the northeast of the Troilus Mine. Geophysical work and associated outcrop mapping show a general trend that hosts the Troilus Mine, continues along Parker pluton (granite) to the northeast and through most of the Troilus North property. Recent mapping and data compilation show that mineralized zones at the J Zone are in line and continue on to Troilus North. Due to its size and lack of exploration investment, the Troilus North land package remains open for discovery, specifically along a magnetic low trend which can be followed over 4.5 km from the J Zone to the high grade boulders outlined by Inmet in the 1980s, and over 10 km along the Northeast trend. A portion of the 2019 exploration spending will be directed towards activities at Troilus North. The integration of historical information, plans for surface mapping and sampling, as well as target prioritization for future diamond drilling have already commenced. In June 2018, Troilus Gold said it has successfully completed a $15.75 million financing that is said would be used to continue exploration efforts to restart the former Troilus Mine. The financing consisted of a private placement of over 4 million shares (that qualified as flow-through shares) priced at $2.46 each and 3.2 million common shares (that qualified as flow-through shares) priced at $1.82 per share. By completing the financing, the company was able to expand a planned 30,000-metre drill program last year by another 5,000 metres. The drill program was designed to confirm and expand existing mineral resources from the Troilus Mine, as well as explore down dip and along strike from known mineralization.